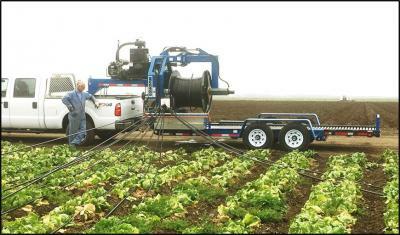 The MegaBinder is an end-of-row retrieval system designed specifically for collecting agricultural plastics in a format that allow users the capability to create transportable ready-to-load rolls. Whether you are maximizing transportation efforts locally to a recycler, or direct container loading, this comprehensive retrieval system creates uniform, dense rolls of used agricultural plastic. Multiple lines of material can be retrieved simultaneously, and additional lines can be fed into the growing roll of wound product while the MegaBinder is retrieving, allowing continuous operation of the machine, and a very efficient retrieval process. A tensioning system is incorporated into the traverse head helping to create very tight dense rolls, while simultaneously cleaning trash and shedding liquid from the discarded material. Roll densities are equal to, or greater than, those obtained by other densification techniques, such as baling, but at a much lower cost, since there is no need for any additional compacting. Rolls are “container-ready” at the initial field collection. Combining the retrieval and densification process into a single operation creates a highly efficient process that is less expensive and safer than multi-step systems such collection and baling compacting. Rolls can be loaded in the field. Collected material is hydraulically ejected from the winding arbor and onto the bed for transporting. Drip tape rolls are average 800-1200lbs. Collect Fume Film, Mulch and Drip-tape. Integrated Safety shut off Switch. 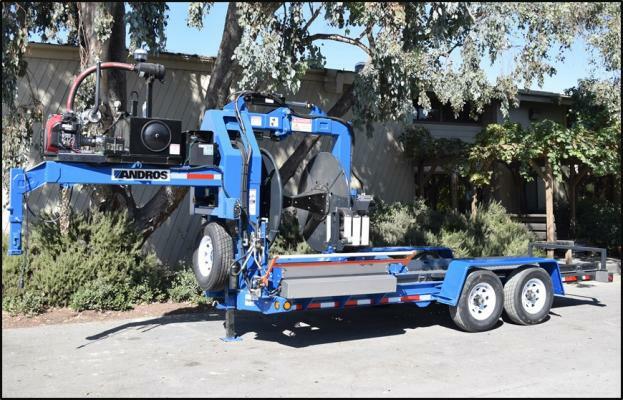 DOT Tow Package with 2-5/16” Hitch. Gooseneck or Bumper Pull.